Let's keep this project simple. The kitchen remodel was detailed, time consuming, and intense, so let's keep the bathroom remodel simple. That includes time as well as expense. Let's replace the window though, from an old energy leaky one, to a new energy efficient one. Window still needs to be small to maintain bathroom privacy. Old window measures 29 by 32 inches. Hmm, no one around here carries windows that size. Special order? Way too expensive. Oh look, Lowes sells octagonal windows closer to the right size. Hmmm. Plain octagonal windows reasonable, fancy octagonal windows expensive. One of those plain ones is a definite possibility. I'm bored. Let's look online for octagonal windows. Wow. Look at these pretty stained glass ones on Ebay. They're less than half the price for something similar at Lowes. And they don't cost too much more than Lowes' plain octagonal windows. Let's see, 24x24 inches. Same size as the ones at Lowes and perfect for a bathroom. Being stained glass, they let in light be can't be seen through from outside. Good for privacy. That means I won't have to worry about a curtain or window blind. I need to subtract that from the cost. Plus, Dan loves stained glass. "Dan, what do you think?" Love the logic! It's gorgeous. It is very pretty and practical and logical! I'm going to play devil's advocate here. Which direction does that window face? The street, the neighbors? If you stand between the source of light and the window your silhouette could be viewed through the window. Frosted windows only have the illusion of privacy. I have add curtains, shutters or blinds to bathroom windows after being told folks were seeing more than I wanted them to. Michelle, Sue, & Linda, thanks! Louise, I'm with you, though this is the first time we've not had plain clear glass for a bathroom window. I definitely like not having to worry about a curtain or blind. Judy, we had to think through those things as well. It faces a neighbor's house, which is on the other side of our front pasture. Next post will show installing the window so you'll get a better idea of it's position (from the outside 1st, a separate post will show it from the inside). It is possible that someone actually looking, could see the head of a person standing in the tub (for a shower). I figure though, that the shower curtain will add whatever additional privacy is needed. Glad you splurged & got the stained glass window. I'm sure it will bring many a happy smiles to your bathroom time. Isn't it funny how something so "insignificant" can bring so much joy? A person just has to accept that there is a process to things. The shower curtain might be your privacy ticket, but I got the opportunity to see my neighbor's side of my yard when I took care of their house this summer. It turns out, when a tree or some other focal point is in between you and them, the tree draws the eye. It happened with my iron fence and olive trees in California. It seemed like no coverage, but all people really saw was the leaves on the olives outside the fence. Could be time to plant a rose of sharon or some other beauty that just stops the eye from proceeding. Is it single pane glass? Carolyn, that is so true. And it really didn't cost us that much more than a special order replacement window of the same size. Barb, that's true about eyecatchers. We actually have quite a few of those, mainly the goats, but also trees and shrubs during summer In addition, our pasture is about two generous house lots in width, so it's not like looking over from next door. Because of the goats, we have future plans for a privacy fence along that side of our property, to block their view from the goats. It will block their view of the house too I reckon. David, it's triple pane, with the stained glass in the middle. Love it! I'm a stained glass fan too. Too bad I don't have any. Will definitely add to the list. Leigh, I am so happy to see that you turned to Etsy for your stained glass window. I too try to use Etsy as much as I am able for my purchases, it is my way supporting my fellow etsians. Love the window, your bath will glow when the sun hits the window - how beautiful. I love it! My mom has one up in the peak of the roof in the livingroom extension. It is plain though, so she bought some contact paper that looks like stained glass and put that on it. Makes a beautiful rainbow across the livingroom when the light hits it. Love it - the rationale AND the window! DFW, most of what I've seen in stained glass has been too expensive. This was a great find. Martha, well, it is hand crafted by a stained glass artisan, but I didn't find it on Etsy. 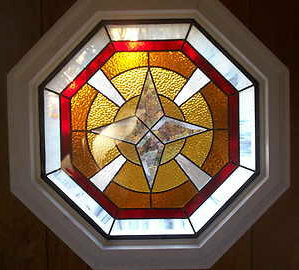 :) Etsy does have gorgeous stained glass, but there wasn't anything I could use and afford for an exterior window at the time. Michelle, Lowes makes no claims that their octagonal windows are energy efficient! This one wasn't labeled energy star (doubt a hand crafted item could qualify anyway, but we got the extra pane of glass to make it triple glazed, which should help. Bettina, thanks! Thanks to our Leyland cypresses we have good blockage of our bath and bedroom windows too. I agree about curtains to keep in warm air (or cool air in the summer). That really helps a lot. Truly beautiful! Who can resist stained glass? Not I! Really, really beautiful! Perfect choice. Very beautiful window. Every inch of your place is really coming together. It's been so long since I've posted or checked other posts. It's been fun catching up and seeing everything you're doing. Happy Holidays. 5M&aC, thanks! I'm really glad we made the choice. Bernadine, good to hear from you. Life does indeed have it's busy moments. :) I'll be on my way for a return visit soon. Really?! Shows what I know... I thought all commercially available windows were rated for energy efficiency. I bet that it will be great, since it's triple paned. Enjoy! Michelle, I checked those windows to see if they had an energy star rating, but there was no mention of anything for energy efficiency. Most of Lowes windows seem to be energy star, but they do have some aluminum replacement windows that are not! Just shows the consumer can't make assumptions, doesn't it? Leigh, Yes. Perhaps our motto ought to be, "take nothing for granted."